Getting your tires truly clean requires a quality cleaning agent and the TUF SHINE Tire Cleaner is a great choice. Since your tires are the only thing actually touching the road they are generally much dirtier than they first appear. The formula quickly penetrates the surface to release deeply embedded road grime and chemicals from previous tire dressing applications. Spray it on the tires directly and then agitate it with a brush like the TUF SHINE Tire Brush. Work it in thoroughly and rinse the surface when you are done. Getting the tires completely clean and free from all contaminants is of the utmost importance before applying a tire dressing. It's even more important if you want maximum durability from the amazing TUF SHINE Tire Clearcoat. This product will last months and sometimes years if you do a thorough job cleaning the surface. 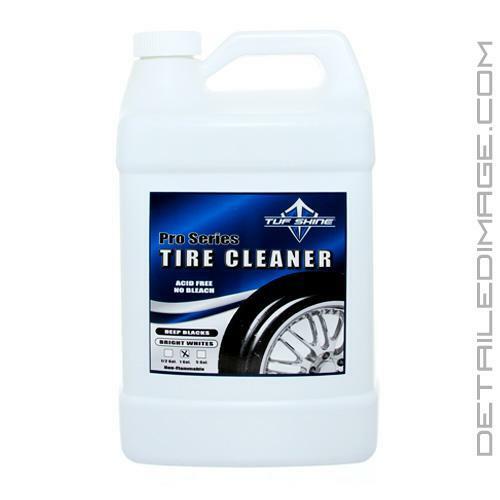 So start off with a great tire cleaner like the TUF SHINE Tire Cleaner and you'll love the results afterward. The 128 oz Conc size is the concentrated version of this same great cleaning formula. You can dilute it 1:1 with water, so one jug makes 256 ounces. *When used as directed. May cause minor spotting on some uncoated aluminum wheels. DO NOT USE IN DIRECT SUNLIGHT OR ON HOT SURFACES - DO NOT ALLOW TO DRY ON WHEELS OR PAINT. Spray cleaner on tire and let stand for 30 to 6-0 seconds. Wet a stiff bristle brush and scrub tires thoroughly working the cleaner into a lather. Rinse and repeat until suds appear white. Do a final rinse. Allow tires to dry completely before applying tire shine/clearcoat. IMPORTANT: After TUF SHINE CLEARCOAT has been applied, use mild soap and water ONLY to clean tires. Harsh tire cleaners may dull the TUF SHINE finish. Works just as advertised. This will be my go-to tire cleaner from now on. Still needs elbow grease, but worked great on rubber with 60,000 miles. The best! No other tire cleaner works as well.